How often have we raved about Portugal’s wine diversity to an eager and attentive audience craving more availability in their own local wine shops? How many times have we made you lick your lips, while we reminisced over the various Portuguese meals we’ve savored ranging in both style and in flavor? And how frequently have we urged you to buy that ticket and come to Portugal to experience the awe inspiring beauty of a landscape that is as varied and beautiful as the people themselves? The number of times we’ve beseeched you, inspired you and taunted you are too numerous to count, but never have we heard of you taking the plunge and accepting an invitation to adventure. But now, we have the ultimate wine lover’s traveling guide to not only give you that final nudge for you to set your dates of travel, but the resources to ensure that you will have an absolutely fabulous time! On our recent trip to Portugal, we unexpectedly ran into Charles Metcalfe and his wife Kathryn McWhirter, both internationally respected UK wine journalists, during Essencia do Vinho’s Grand Tasting in Porto. Unbeknownst to me, Charles was even more witty and charming than one of his dearest friends, Oz Clark, known to be as smooth and silky as a 1994 Niepoort Colheita. With a never ending twinkle in his eye and an open and loving disposition, you can’t help but like him. While Kathryn, his long haired and big blue eyed wife, although equal in heart, had a stare that was equivalent to a truth serum, enticing you to share your innermost secrets. Intense and curious, she appeared as the perfect compliment to Charles’ jovial ways. 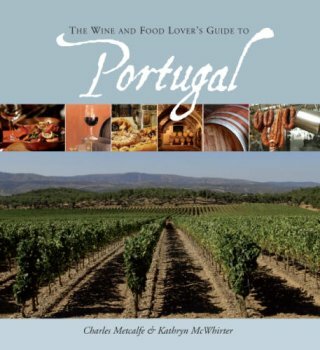 Therefore, between them both, this perfectly matched dynamic duo accepted the challenge in 2007 to meticulously craft the first and only comprehensive book on Portuguese wine and food currently on the market called, The Wine and Food Lover’s Guide to Portugal. The book consists of 446 pages of well researched and incredibly well designed text that not only covers your basics, but also the unexpected. As you may remember when we dedicated July and August of 2007 to Portuguese wines, we mentioned that the Portuguese place greater significance to regional wine demarcations more than they do to DOCs. Charles and Kathryn chose to use this same system, distinguishing chapters by color coded regional demarcations as a convenient and logical way of organizing the book. Hence, of the 21 chapters, 12 are dedicated to: Vinho Verde & Minho, Tras-os-Montes, Douro, Porto & Gaia, Beiras, Azores, Lisbon, Estremadura & Ribatejo, Terras do Sado, Alentejo, Algarve and Madeira. The book is then further subdivided in each regional chapter to include maps (which mark modern and traditional restaurants, visitable wineries, wine shop/food shop/markets, sleeping options, views from above and star attractions), information on wineries, places to eat, places to explore, wines to look out for and local terminology that might be worth your while to learn. Beyond specific regional chapters, Charles and Kathryn also included chapters on: using the book effectively, Portuguese treasures that lie beyond sandy beaches, a general overview of Portuguese wine, a little history of Portuguese food, a listing of common Portuguese grapes, architectural heritage, a Portuguese language lesson, a bibliography and a comprehensive index. Having spent the better part of yesterday reading this book from cover to cover, while awaiting plans, trains and automobiles back to Barcelona, allow me to explain why this is a “must have” as a reference book. There are your Lonely Planets that are jam packed with information but are as exciting to read as the user manual of an egg beater, there are your coffee-table books that are beautiful but completely useless for anything beyond the occasional “oooh” and “ahhh”, and there is this book, filled with gorgeous pictures but enough comprehensive and user-friendly information to both savor and skim depending on my needs. This was their simple and effective method of exclusion as quoted in their book and reiterated over breakfast last Sunday morning. But their methodology, fortunately, went a little beyond, not just excluding wineries they didn’t like, but highlighting wineries that both have good wine and good tourism options. In addition, they feature wineries that although lack in tourism options, still show some incredible wines. As both a wine lover and an avid traveler, this information gives me exactly what I’m looking for: information about the wineries that I can both visit and taste with, while at the same time, letting me decide if those wineries of good quality, but lacking tourism opportunities, are worthy of hunting down in either a restaurant or retail shop! For me, this was great forethought! Lastly, they were thoughtful enough to include a section on language to encourage us to interact with the local culture by providing a comprehensive list of vocabulary and phrases. This is so cool simply because I appreciate those who try to understand a culture by experimenting with not only their gastronomy, but also their everyday communication. Granted, you can generally get by with English in Portugal, but kudos to you if you take their handy tips and give Portuguese a shot! We hope you enjoy the book, and please share your thoughts if you’ve already read it!